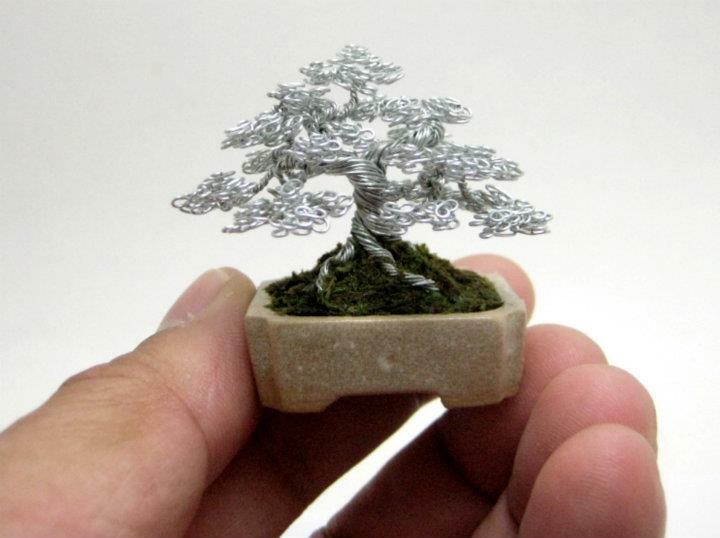 I met Ken through Facebook and discovered that he was an artisan creating small bonsai trees out of wires. I had only seen this before at Green Club in Tokyo and was delighted to find they could be purchased from him over at eBay. You can see what he currently has listed by clicking this link. 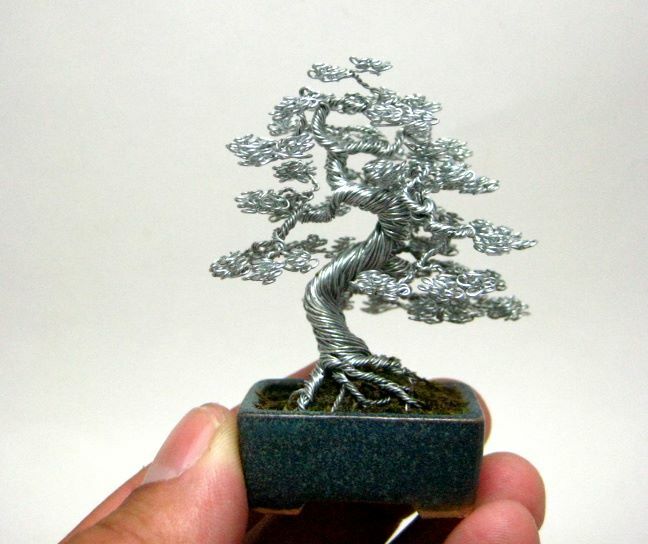 What follows is my request to Ken to provide me with some background information on his interest in bonsai and ultimately is desire to create them from wire. I acquired two of these trees for KJ and they now sit on a nice bonsai stand in our display cases. I hope you enjoy the post and photos. I got into bonsai in 2007 when my son, who was three years old at the time, saw a mallsai in the Wal-mart garden center and wanted it to buy it. We both liked the mudman sitting next to the juniper whip so I decided to shell out the $12 to buy it. The mudman had a broken arm but I thought maybe I can buy another mudman to replace it. The search for a replacement mudman was where my addiction to bonsai really started. I started visiting bonsai nurseries and retail outlets that I’ve never even bothered to look at in the past and the trees they carried really inspired me. The people at these nurseries were really knowledgeable and offered me tons of advice that helped me start up my own collection. The most important advice I gained was how to recognize a bonsai. In less than a year, my collection grew to approximately 80 trees and I used each tree to practice on extensively. Not many of those trees survived but the ones that did taught me a lot about styling and the importance of timing your work. I enjoy working on trees and I needed a way to keep busy during the winter months. I also needed a way to improve my styling techniques without having to spend too much on material. 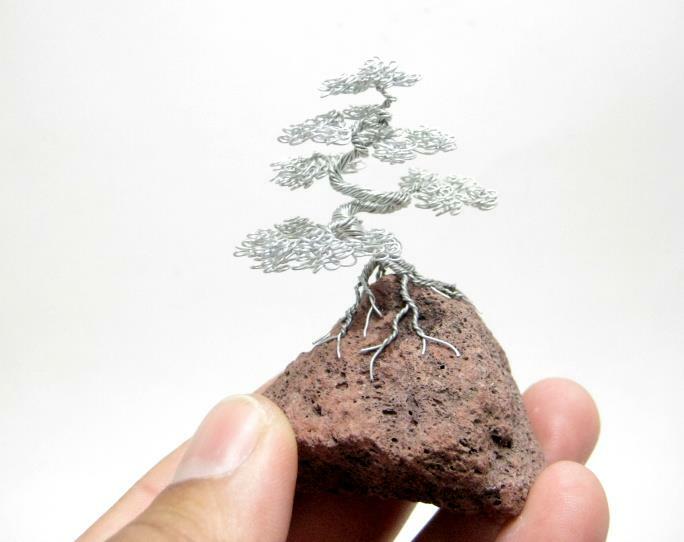 There were some vendors at a swap meet selling wire bonsai trees, they weren’t very impressive as they were shapeless but the sight of these trees gave me an idea. I made my first wire tree during Christmas of 2007 as a gift for my wife. The wire I used wasn’t very good and my shaping techniques weren’t worth talking about either. But my wife, as well as everyone else we showed, was thoroughly impressed that it was possible to make a tree out of wire. In February of 2010, I made my wife a second tree for Valentine’s Day. My technique has improved by now but I still didn’t have the right wire and I was desperately in need of an easier way to shape the foliage. That’s when I saw Kevin Iris’ work. Kevin posted his trees in a forum after seeing my work. I saw how efficient and how beautiful his trees are and I knew I had been shown a better and faster way to make the foliage. I finally found the perfect wire for my needs and started making the trees in abundance. I always do things in abundance when I’m learning something. It was the same as when I first learned bonsai, I knew the only way to get better was through perpetual practice. I made a lot of trees and needed to get rid of some to make room for more so I started selling them. I had no idea what to expect from when selling my trees, the first few went for next to nothing but the prices got better as I got more practice, this meant I was doing something right and that I’m getting better at it. I’m nowhere near as good as I would like to be with wire trees but I’m at least comfortable with the material now. 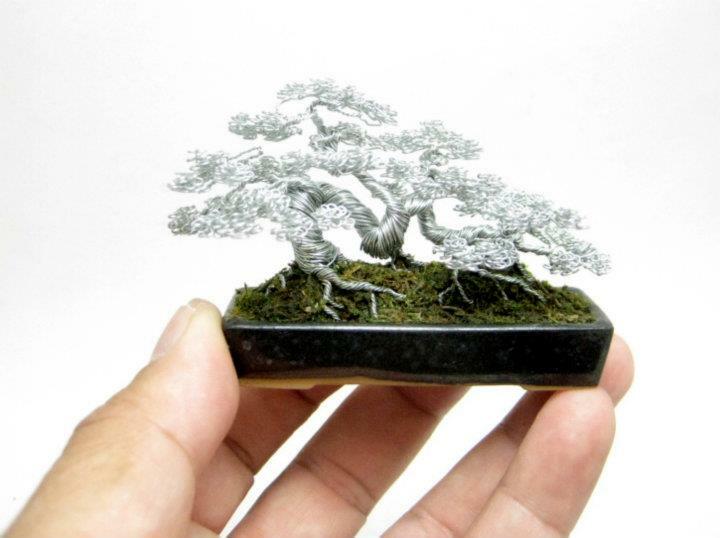 Just as it is in bonsai, it takes a lot of time and practice to understand the material and respect it. While my passion is still with live bonsai trees, these wire trees help me hone my styling skills and I never get bored learning anything related to bonsai. You can see more of his tree by heading over to Facebook. Hi Ken, after a recent heart attack,mu kids thought i should have a hobby (I am 70 yrs old) so I found sal villano website, and bought his book on how to make trees, I have made 7 or 8 now and am getting better and more interested..then I saw your bonsai trees WOW I was blown away they are the most beautiful wire trees I have seen..so my question is do you have a instruction book I could purchase..or perhaps a video,I would love to be able to try and make trees similar to yours. Thank you very much for the compliment. I\\’ve never thought of making videos or books on this subject since other great artists like Sal Villano are already doing that. Bill, email me at itsjustken@hotmail.com. I have purchased Sal’s book but he is more varied in the trees he creates and your style is more specialized. I am looking to try and make these as wedding center pieces. I have over a year before the date so I do know there is no short cut to getting this right. We are going with a orential theme as a tribute to my grandfather who recently passed. If there is anyway you would be willing to put together a guide or tips and tricks for a beginer? I would be more then happy to compensate you for your expertise and time. You can add me on facebook http://www.facebook.com/itsjustken or email me.